Eli’s Cheesecake has been one of Chicago’s favorite treats for decades. As a local artisan food producer that seeks to purchase as many ingredients as possible from local and regional producers, the company has earned a place at the Good Food movement’s dessert table. But Eli’s Cheesecake goes beyond those basics to promote the economic opportunity and social welfare aspects of Good Food. Eli’s Cheesecake is a major supporter of public educational institutions focused on food industry skills and urban agriculture, such as the Chicago High School for Agricultural Sciences — from which it purchases honey for use in its products — and Wilbur Wright College, part of the Chicago city college system. 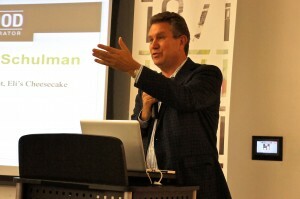 Mark Schulman of Eli’s Cheesecake speaks at an Oct. 1 event introducing Family Farmed’s Good Food Business Accelerator. The company also works with the Greater Chicago Food Depository on food drives, and has received note for its efforts to provide employment for people with disabilities. 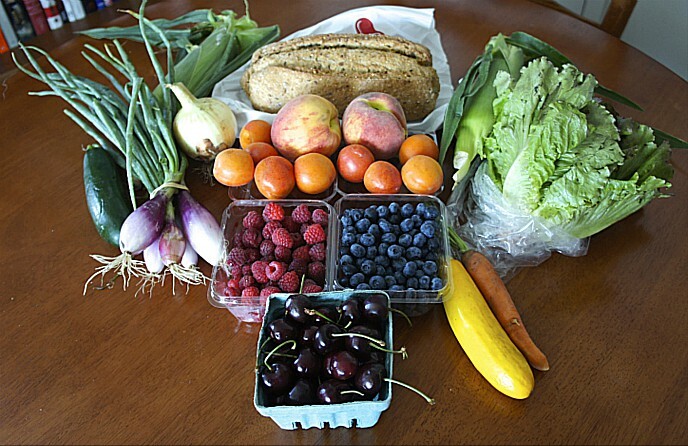 Marc Schulman — the company president and son of founder Eli Schulman — is an ally of FamilyFarmed‘s efforts to expand the markets for local and sustainably produced food. He is a co-chairman of FamilyFarmed’s Financing & Innovation Conference that kicks off the 11th annual Good Food Festival & Conference, March 19-21 at Chicago’s UIC Forum. 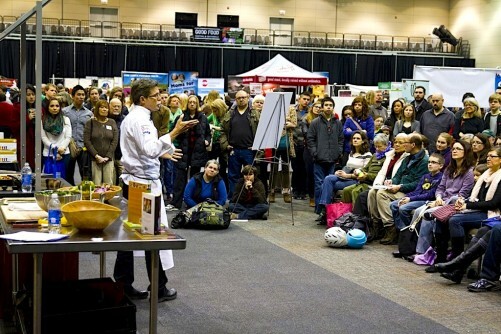 Schulman will be a participant in the Welcome panel on the morning of Thursday, March 19, and will moderate a panel on Good Food Success Stories panel that afternoon. Eli’s Cheesecake also will be serving dessert treats at Localicious, on Friday evening, March 20, a highlight of the Good Food Festival & Conference and one of Chicago’s best annual food and drink tasting events. Among its samples will be a vegan cheesecake made with tofu produced by Phoenix Bean, whose owner, Jenny Yang, is a Fellow in FamilyFarmed’s Good Food Business Accelerator and was profiled recently on Good Food on Every Table. Of course, with a name like Eli’s Cheesecake, you know you are going to get a nice helping of indulgence with all of that Good Food citizenship. Choose Chicago, the city’s official tourism organization, published a post by blogger Amy Bizzarri, about a visit she made with her children to the Eli’s Cheesecake factory and headquarters in far northwest Chicago. You can read the full piece here, but a warning: There is a photo in there that may give you an immediate craving to run out and buy an Eli’s Cheesecake. This entry was posted in Food Artisans, Food Entrepreneurs, Good Food Business Accelerator, Good Food business development, Good Food Festivals, Good Food Financing Fair, Good Food marketing, Good Food Success Stories, Sustainable food education, Sustainable food retailing and tagged Chicago High School for Agricultural Sciences, Eli's Cheesecake, F, FamilyFarmed, food artisans, Food Entrepreneurs, Good Food Business Accelerator, Good Food Festival & Conference, Good Food movement, Marc Schulman, sustainable food retailing, Wilbur Wright College. Bookmark the permalink.